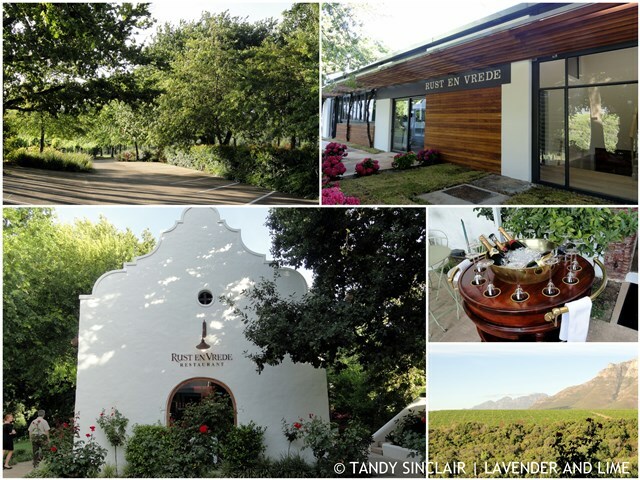 When we were having dinner at Cavalli, Dorothy told us that John had secured them a booking at Rust en Vrede (Rest and Peace) to celebrate their first wedding anniversary. I mentioned that I had wanted to go there for a while, and could she please let us know how it was so that I knew whether to book or not. John then suggested he change the booking to four, and that we join them and make it a joint wedding anniversary celebration. As our is 4 days before theirs, this made perfect sense. We arrived shortly before 18h30 and made our way from the parking lot on a lovely pathway through manicured lawns past the wine tasting rooms. The first thing I noticed was a sign saying that no smoking is permitted on the premises. An absolute bonus point for me as even vaping bothers me. We chose a table outside overlooking the lawns and vineyards and waited for John and Dorothy to join us. While we were waiting we were offered a drink from a young gentleman whose sole task it is is to serve drinks. I settled for a glass of still water (which is complimentary) and we took a look through the wine list. It is a tome and far too much to read through and make choices. After John and Dorothy arrived we decided to start with a bottle of MCC. However, the owner of Rust en Vrede, Jean Engelbrecht, has made a decision to only serve French Champagne and we decided to rather go for a local white wine. I would have tried the Charles Heidsack champagne as I have been told this is the best in the world, but price wise, it can wait until I find a local distributor. John who is a winemaker decided he also was not going to page through the wine list and so the sommelier came over and suggested a bottle of the Cape Point Isliedh 2012 (R400) for us to start the evening off with. This wine has perfect minerality with a hint of limes, and tropical fruit. We managed to stay outside for the entire bottle, enjoying the stunning view, snacking on canapés, and talking up a storm. Our nibbles consisted of a felafel, pumpkin fritter, pastry straws and a croque monsieur. As there are heaters above each table, the setting sun did not make us feel cold at all! After we had finished our wine, we were shown to the table by a very friendly waitress and given our menus. We decided that choosing wines for the a la carte menu was too daunting and so decided on the 6 course tasting menu with wine pairings (R1150 per head). As we were there for a celebratory meal, I took photographs but no notes. I asked our waitress if I could please have a copy of the menu and she told me that as we were having the tasting menu with wine pairings we would be receiving gifts when we left and that the menu would be with the gifts. With this information, I did not even read what we were having! We were offered bread rolls before the meal, and after the first course and the variety was good, and the bread excellent. 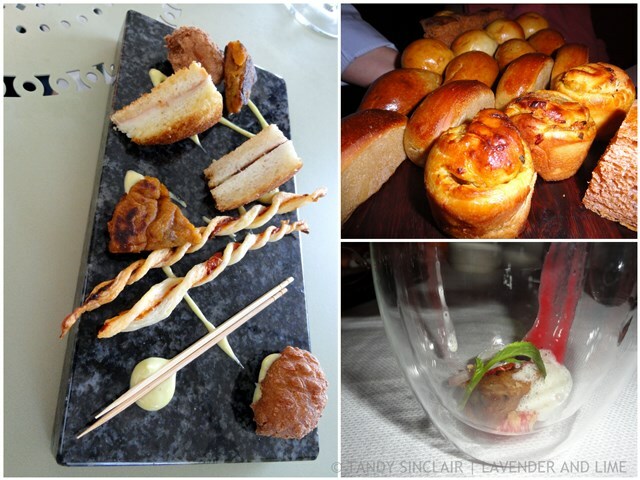 The amuse bouche was pork belly which was very tasty. Our first course was a scallop and sea bass ceviche, served with smoked avocado, sushi rice, wasabi wafer and a ponzu emulsion and was served with Keermont Riverside Chenin Blanc 2013. I absolutely loved every bite of this dish and the scallops were perfect. The creamy texture of the wine suited the dish perfectly. This was followed by tortellini e fagioli served with white bean, smoked tomato, parsley gel, Parmesan and pork crackling. The accompanying wine was a 2013 Jordan Barrel Fermented Chardonnay. The one bite tortellini were filled with a liquid centre but sadly for me, the pasta was too thick and tough. This was the general consensus around the table. The wine had a similar palate to the previous one, both having hazelnut and citrus. The next course was crown roasted baby chicken and leg presse served with leek, asparagus, truffle, white Port and foie gras sauce and a glass of the 2009 Ashbourne Sandstone from Hamilton Russell Vineyards. The chicken was extremely tasty and this course was really good with the minerality of the Sauvignon Blanc complimenting the dish perfectly. By this stage we were all looking forward to the Kalahari blesbok loin as it would be served with a glass of red wine. The dish was accompanied by shank sausage, celeriac, apple, chestnuts, pomme dauphine and the much awaited 2011 Rust en Vrede Estate Cabernet Sauvignon. The strong, intense wine with a black currant finish was prefect for the meat. Until I read the menu today, as I was typing up this review, I could not remember what the meat course was, other than it being venison. I think the wine leading up to this point starting fogging the memory. But, the goats cheesecake was so bad that I could well remember that the next morning. It was served with beetroot, a goats cheese beignet, elderflower jelly and an olive tuile and a glass of Sumaridge Pinot Noir 2011. I managed one bite of the cheesecake but as I am not a huge fan of goats cheese, this did not work for me at all. Dave who prefers a cheese course to dessert and does not mind goats cheese did not like this course either. Thankfully I enjoyed the cherry undertones of the wine, and finished the glass instead of the cheesecake. 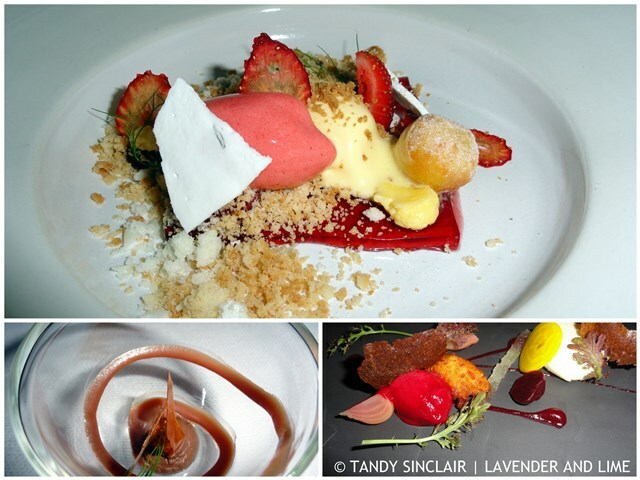 We were then given a pre dessert to sweeten our palates, which was much needed and then our dessert was served. I loved the strawberries and cream which was a strawberry course served with clotted cream, a thyme meringue, jelly, shortbread and a doughnut. The wine for this course was the 2012 Shannon Macushla, a pinot noir noble late harvest with a hint of honey on the palate. After dessert, Dave and Dorothy had an espresso each (R15) but John and I decided we had not had enough red wine! 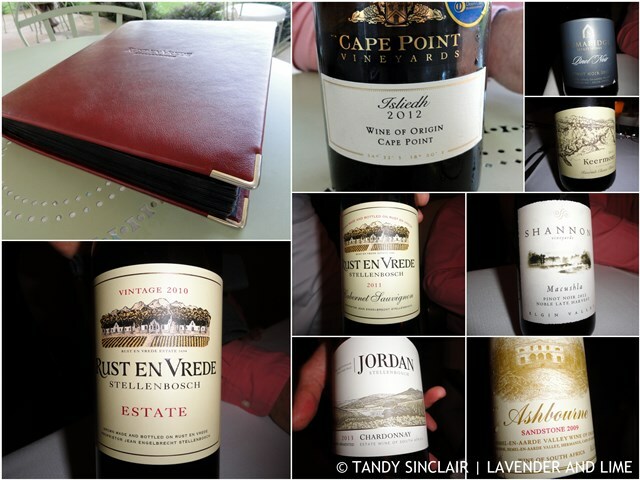 The sommelier suggested the Rust en Vrede Estate 2010 (R115 per glass) and I must say, it went down very well! 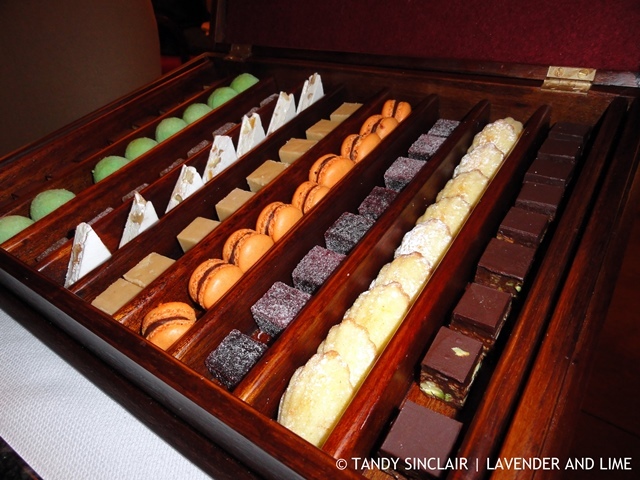 Our wine and coffees were served with petit fours and I loved the presentation, and the fact that we were given a choice of what we could have and there was no restriction. The chocolates paired perfectly with the wine, which has dark chocolate on the palate and whiffs of vanilla on the nose. I was the last person to leave the restaurant and I was assured that Dave had been given the menu. When I got to the car I discovered that we had neither the menu, or our promised gifts. Dorothy told me they had been given their parting gift of a brownie and a chocolate. Overall, the food was great but did not blow me away. The wine pairings worked well but given that we started with a bottle of wine, and had 6 glasses during the meal, and a glass at the end, I did end up drinking quite a bit. I think it would be a nice touch to recommend wine per the glass for each of the a la carte menu dishes so that people can make decisions based on the meal. The atmosphere is perfect with the smallest attention to detail looked at, even in the bathrooms. 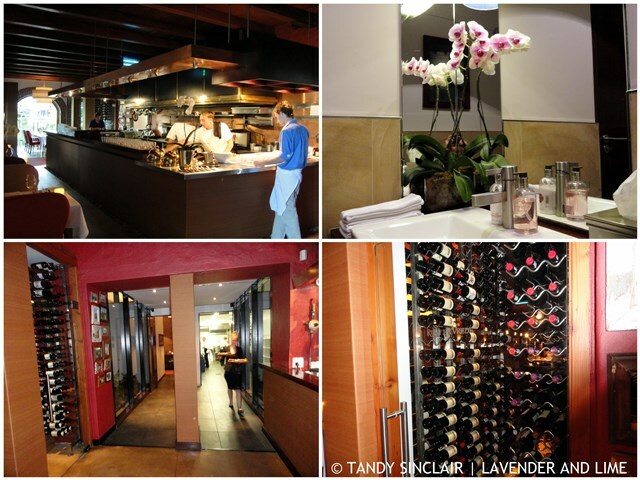 I loved the open plan kitchen and glassed in wine cellar and would go back to enjoy a meal of my choosing. 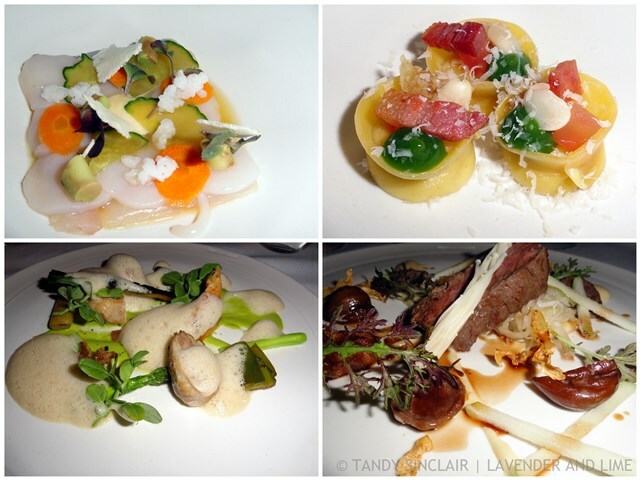 The cutlery, crockery, glassware and linen are of the highest quality and the entire evening was memorable. They are open for dinner Tuesday to Saturday and bookings are essential. Contact them on +27 21 881 3757. You are encouraged to inform them at the time of booking if you have any special dietary requirements but I was pleased to note that our waitress asked us when we sat down if we had any food allergies she needed to know about. This is a first for me when dining out. Whoa to that strawberries and cream dessert!! Everything looks delicious! It seems like this restaurant has good points and areas it could be improved on. Can’t believe they forgot the menu and parting gift, that is most important!